60’s Music Show – Feelin’ Groovy! 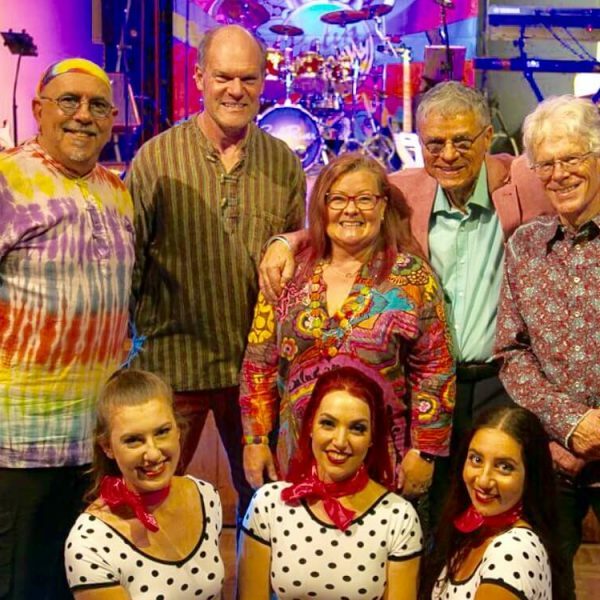 Feelin’ Groovy – Cool River’s Tribute to the 60’s Music Show – engages audiences of all ages with timeless classic hit songs from the 60’s decade. From 1960 – 1969, it includes songs from the Summer of Love, Motown, the British Invasion and Swinging London plus a few perennial Aussie favourites! Take a walk with us as we adventure through the 60’s, and discover the clothes, the dance moves, the fashion and the music, all presented by a live band with 3 different vocals (male and female) and the most energetic Go Go Dancers you’ve ever met – The Riverettes. Because who doesn’t love the 60’s? This Feelin’ Groovy features 60’s music from international and local chart topping bands. Some of these include The Beatles, The Monkees, The Kinks, The Small Faces, The Turtles, The Chiffons, The Supremes, Nancy Sinatra, Cilla Black, and Petula Clark. Some of the Aussie classics include tracks from The Easybeats, The Bee Gees, Normie Rowe and Billy Thorpe. However pre-show requests can be facilitated too as Cool River has an extensive rehearsed repertoire to choose from, and it is therefore fairly easy to mold shows according to client requests. Costumed in clothes from the era, enhanced with top of the range sound and lighting, The Feelin’ Groovy show transports you back in time to the magical era of 60’s music. So you should expect to want to get up and dance. (Make sure you have prepacked your dancing shoes because a fair chunk of the night IS going to be spent on the dance floor!) Let the Riverettes guide you with their professionally choreographed routines that have been designed especially for this show and teach you a thing or two about those popular dance crazes that were all the rage. Remember The Mashed Potato, The Twist, The Loco-motion, The Shimmy, The Swim or The Freddie? The bubbling enthusiasm of the cast will keep your spirits high as you relive the craziest most significant decade in popular culture. Roe Bronkhorst – Lead Vocals. Roe has fronted several rock n roll bands for over 20 years. She can sing everything from ballads to power rock. David Neideck – Keyboards, vocals. David has over 30 years experience as a keyboardist. His orchestration and layering of sounds on stage add to the band’s unique live sound and he also provides backing vocals. Peter Hutley – Lead Guitar, vocals. Founding member Peter has played in bands from a young age and has performed in Korea, Middle East and Asia. He is a versatile guitarist that can play many styles but has a particular love for 60’s music. Jean-Claude Carcaillet – Bass guitar. A Parisian who played bass as a teenager with French rock band “Les Turnips”, he has been playing in various bands in Sydney with Peter co-founding Cool River. Evan has been playing drums from an early age and started performing regularly in bands since the 60’s, covering a variety of styles from pop, rock, blues and heavy metal. Evan also has a strong affinity for all things 60’s music. To find out more about booking 60’s Music Show – Feelin’ Groovy! – Cool River's Tribute To 60's Music for your next function or event, please submit a booking enquiry to All Things Entertainment using the button below. 60's Music Show - Feelin' Groovy!